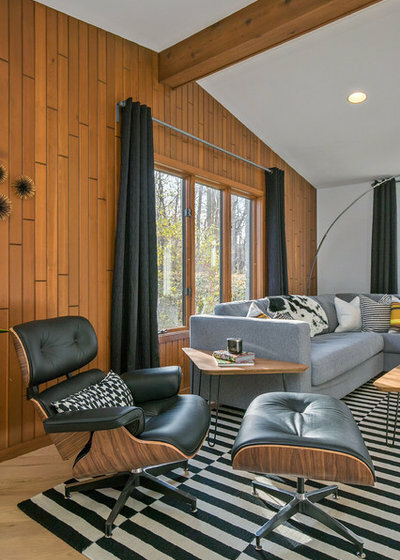 In the Western Connection neighborhood of Grand Rapids, Michigan, known for its enclave of midcentury homes, designer Carly Visser and her husband found a house that had seen better days but had great bones. 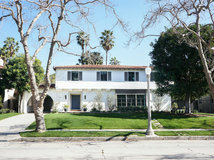 Working within the original building envelope, Visser focused on reworking the layout to create a new master suite, a comfortable kitchen and a midcentury feel befitting the retro neighborhood. 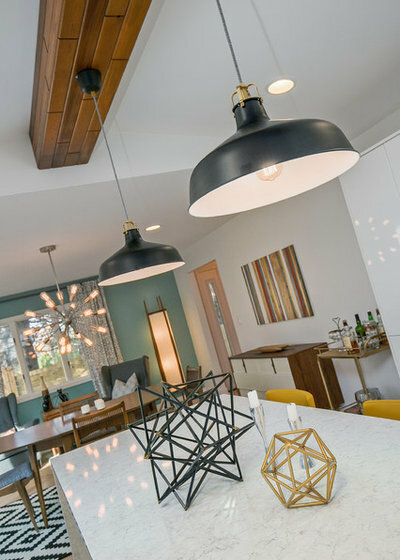 During the 18-month renovation, Visser touched nearly every surface of the house, demolishing the kitchen and bathrooms, swapping out a sea of tile for wood floors, painting all the walls and furnishing the new spaces with plenty of vintage finds from Grand Rapids thrift shops. 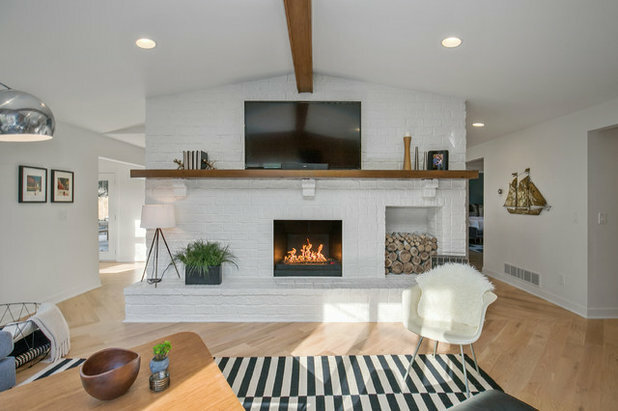 Most of the flooring, wallpaper and paneling was beyond repair, but Visser did restore the living room’s exposed beam and one wall of paneling to retain some of the home’s original character. 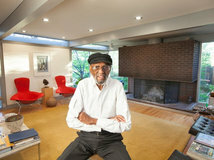 She gave the original fireplace, which had previously been painted, a fresh coat of white paint. 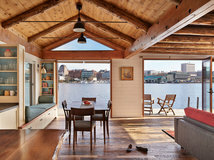 Visser says she took her style cues from the couple’s travels to Scandinavia, whose design vernacular meshes well with the midcentury aesthetic. 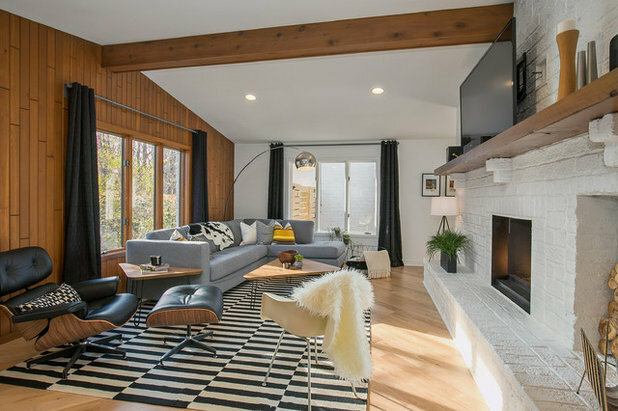 The sofa covered in light gray wool, the striped rug and the faux fur throws are references to Scandinavian style, while the Eames lounge chair and the coffee table with hairpin legs are distinctly midcentury modern. 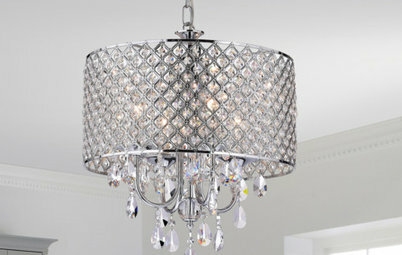 Visser considers the vintage chrome arc lamp, found at a local thrift store, the centerpiece of the room. The wall of cabinets that separated the previous kitchen from the dining room was removed to create a more open, integrated feel. 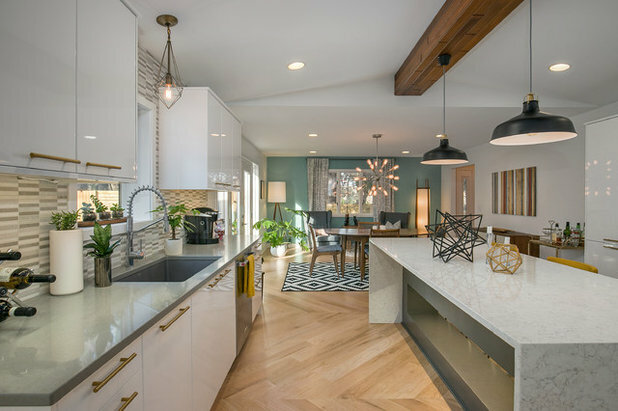 The sink and appliances didn’t move, but an island in the center of the kitchen and floor-to-ceiling cabinets were added along the side wall to enhance storage and make full use of the space. 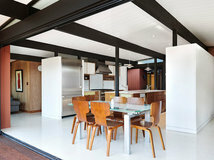 Visser created the wood ceiling beam using some of the old paneling from the living room. The kitchen island is about 9 by 4 feet and has no cabinets on either side. Visser’s vision was to create an island that could hold chairs on both sides and serve as an informal dining table. Because she didn’t need storage here, she was free to create a pass-through so that feet could dangle comfortably underneath. 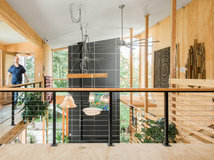 Electrical wiring is enclosed within the structure. “We’ve lived in a lot of houses, eaten at a lot of islands, and we always needed somewhere to put our feet, so I did a cutout. Also, it made it feel less bulky,” Visser says. 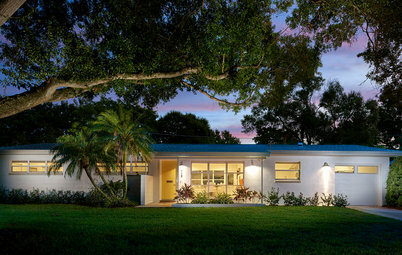 An integral light creates a cool effect at night. 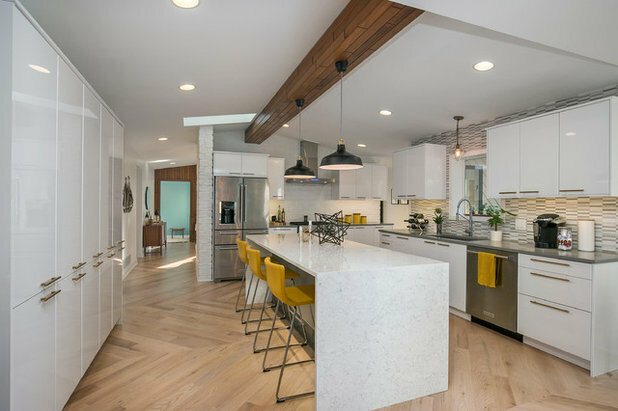 For the countertop, Visser chose a white marble-look quartz with a waterfall edge to contrast with the gray base and coordinating countertop along the kitchen’s perimeter. “The gray breaks up all the white,” she says. The large dining area has more space than she and her husband really need, Visser says. 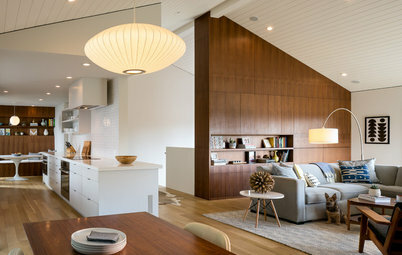 More important to them was creating a lounge area where they could have cocktails together, so she created a conversational seating area next to the dining table. 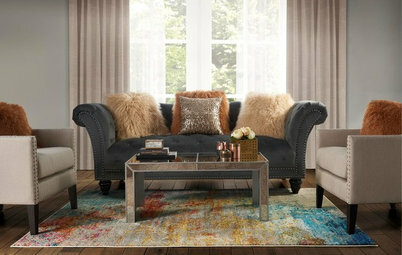 This room received all new lighting and is furnished almost exclusively with vintage items. Visser’s husband made the floor lamp in the corner out of a 100-year-old tripod. 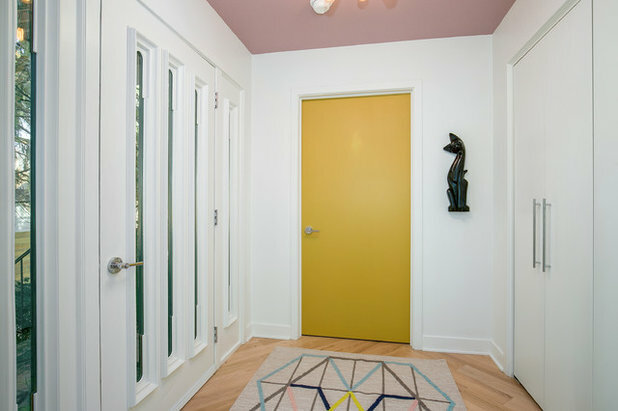 In choosing colors, Visser knew she wanted mostly white walls but didn’t want the home to be too modern or sterile, so she painted some doors yellow and added a few accent walls, such as the one in this room covered in Drizzle from Sherwin-Williams. 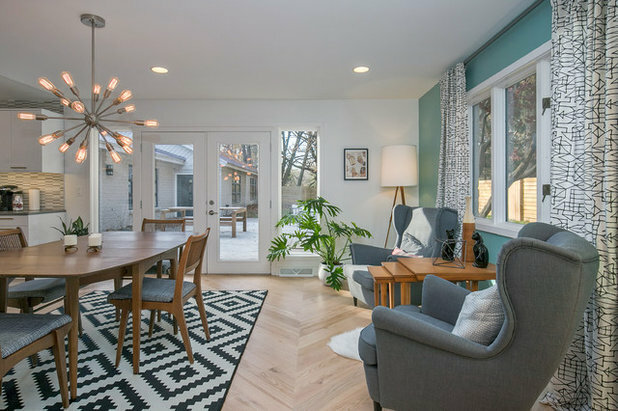 “If you come in the front door, you see a pop of blue at one end, and if you come in from the garage, you see it at the other end, so those were meaningful spots to create focal points,” she says. Visser added some punch to the front hallway by painting the ceiling pink and a door yellow: Both tones are picked up in the Ikea rug, a serendipitous find. Visser hung two vintage black cat statues found at a local antique store in the space for added interest. 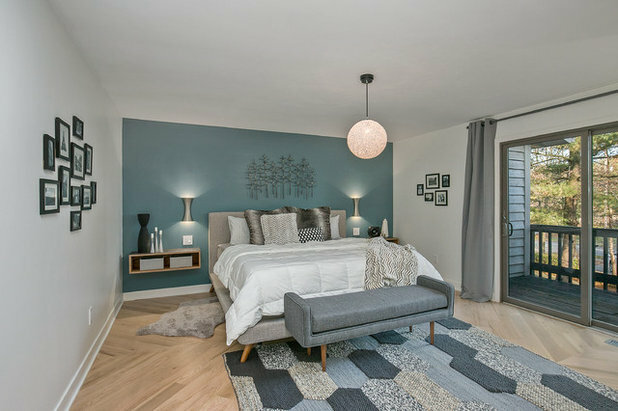 Visser and her husband wanted their bedroom to feel soft and cozy, so they took more cues from Scandinavian design and loaded the upholstered bed with layers of white bedding and faux fur pillows. The bedside sconces and floating tables skew more midcentury, while the warmth of the wood keeps them from feeling too modern. 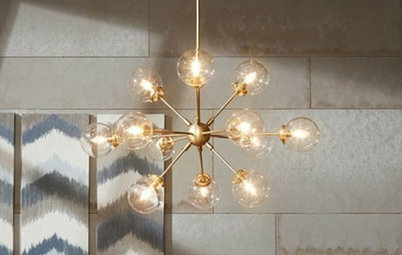 The tufted wool rug and the glowing orb light fixture add more warmth and texture to the room. All accessories on the nightstands are vintage. 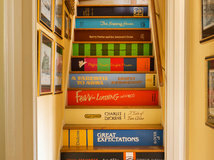 “We spend a lot of time in our bedroom, so we wanted to be surrounded by things we love,” Visser says. 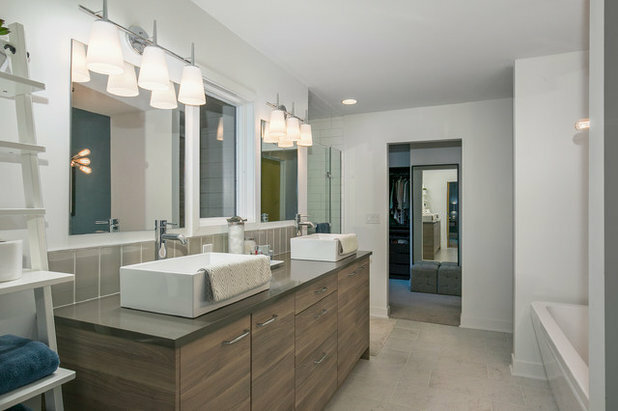 To create the master suite, Visser joined two bathrooms into one in order to fit in a double vanity, freestanding tub, walk-in shower and water closet. Just beyond the bathroom is a “bedroom-sized closet” with a makeup vanity. 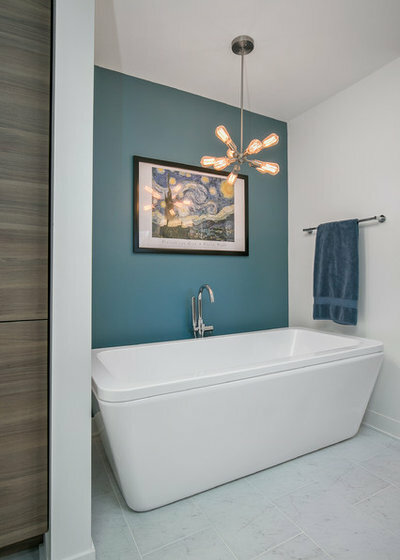 A midcentury-inspired light fixture hangs over the deep soaker tub. 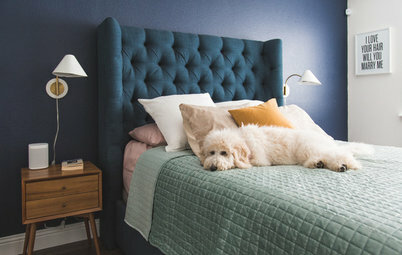 The blue accent wall mimics those in the master bedroom and dining room. I love this house! 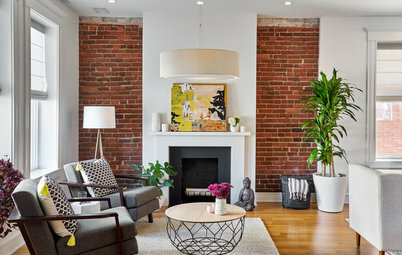 I really like how they painted mostly white walls with the accent wall. 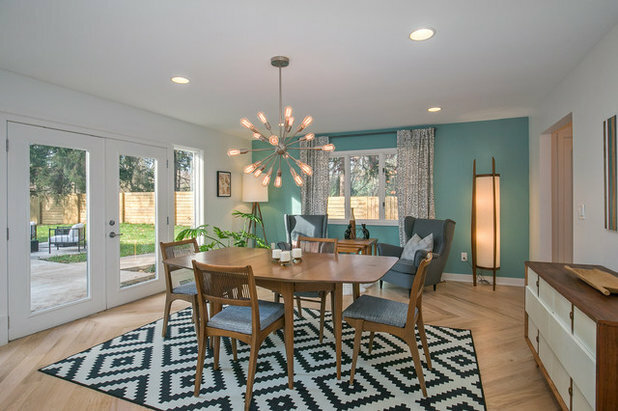 The accent wall color is beautiful! Not too harsh. 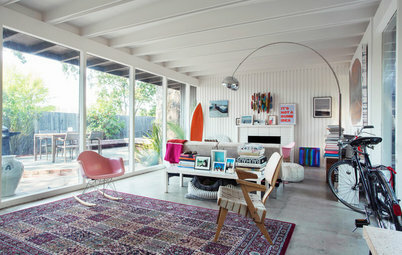 Though I lived mid-century design all my childhood and am tired of it, I can't deny that this is a VERY beautiful home.